Many thanks to reviewer Felix Vasquez. When a spaceship was launched from the doomed alien planet Krypton, a young boy emerged and then was promptly turned over to an orphanage to which an elderly couple, the Kents adopted him. The orphanage is more than happy to get rid of him since his powers begin showing and slowly they turn him into the man he becomes, a mild mannered young reporter who rights wrongs as Superman, the man of tomorrow. 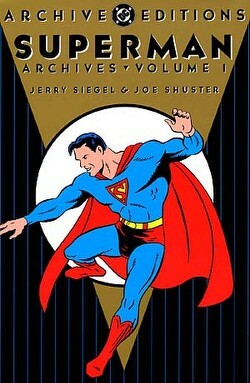 "Superman Archives: Volume 1" chronicles the first four issues of Superman and his series along with snippits from newspaper strips and his regular story arcs. In the first ten or twenty pages we witness an extensive story arc including his saving a man from the death penalty after being wrongly accused of murder, a long story arc in which he attempts to stop another world war by enlisting in the army, and enlisting a war monger to experience the ravages of war, Superman also puts a stop to a crooked mine owner by masquerading as a mine worker, convincing the owner to go down into the mines for a party and trapping them there, and, in perhaps a truly sweet story, Superman saves a man from committing suicide discovering he's an ex-heavyweight champion and masquerading as him to help him rise yet again as the heavyweight champion. Superman rights the wrongs here as the man of tomorrow by giving the rich their comeuppance and helping out the common man. "Superman Archives" is a must for any reader and Superman aficionado. There is a great introduction the master Jim Steranko as well as many ads for Superman, and brisk coloring. Some novelties included within the book are funny strips featuring a wacky dog, little known world facts about the world and animals with real super-strength, short stories of science fiction and crime, and tips on how to become super strong and joining the superman fan club! Nonetheless, this is a book worthy of the purchase for the low price of twenty dollars and is a true collector's item. Story - 4: Don't expect a lot in story as far as the comics go. Most of the comics here are taken from newspaper strips and from the original issues. Back then Superman instead of battling Lex Luthor and Brainiac battled common villains of society which was basically what Siegel and Shuster had in mind all along. As a previous reviewer has stated, Superman battled society's villains ala warlords, mob bosses, evil mine owners, millionaires, crooked politicians, and basically anyone else who wronged the common man. With a rousing introduction at the beginning of the book; legend Jim Steranko prepares you for what you may experience during reading; basically simple stories of Superman righting wrongs all in one issue where everything is wrapped up in a nice bow and the enemies realize how wrong they were. Superman never hesitates to get a little severe, so expect superman with a bit of an edge; he throws men out windows, throws men halfway across the world, and hangs them over power lines while they wail, and he goes undercover a lot as different people to penetrate enemy strongholds. This is a superman influenced by early serial heroes like the Shadow, and Flash Gordon, so he masquerades, sneaks into places, and fights groups of men without hesitation or fear of killing them while he preaches about American law and truth, justice, and the American way. The storytelling is simple and to the point, and you can expect a lot of fun within the action as well. For novelty purposes, there are ads to Superman's fan clubs scattered throughout the book (10 cent admission fee! ), not to mention there are some facts of Superman that some casual observers will be surprised to see: like Superman's parents both dying which sparks his journey to Metropolis, his original name being Kal-L, the way Clark earned his way into the newspaper which constantly shuffles names from the Daily star, to the Evening News, and again to the Daily Star. Everything is black and white here with the good guys doing good, and the bad guys being bad. Art - 5: Joe Shuster's art is a little crude and rigid, but you have to take a step back and really look at it for what it is: Superman's heritage. It's Superman in his purest form, muscles, chiseled jaw, crew cut, and his costume. There is a lot of inconsistencies such as Superman's belt and red boots constantly appearing and disappearing, but nonetheless, it's simplicity that makes this so much fun to look at. Superman is muscle-bound and heroic, while the villains are creepy, pudgy, scandalous, and ugly. Lois has the basic look of a woman of the times and barely has appearances, but Shuster manages to pull through. Steranko says it best: "What Shuster's art lacks in sophistication and pretention, it makes up for in raw energetic imagery." It couldn't be truer, because as the book progresses, expect a lot better art work which is often bright and beaming with energy, not to mention Superman's form becomes a lot more defined as the man we know and love today. His boots become a staple, as well as his yellow belt, and we manage to get to see more Metropolis as far as scenery and more people and characters. Lois becomes a lot more defined as well and there's a hint of Kirby within her design. All the while, this is simple but very fun art that became a staple at DC for a very long time. Cover Art - 5: The cover jacket for the book is the cover to the first of his series, but within the folds, there are a lot of glimpses of Superman covers including his trademark picture of him breaking free from chains which Alex Ross later depicted, Issue 2 is where we see Superman yet again in a full shot. None of the covers ever really portrayed the story within the issue, so we have the glorifying of his character saving a kid from a running train, and fighting off villains, as well many other beautiful poses that are very impressive as the defining style of the man of steel that would be copied for decades to come.